The first downloadable content pack for Assassin's Creed II is enjoyable to begin with, but short, and has nowhere near the variety of the main game. 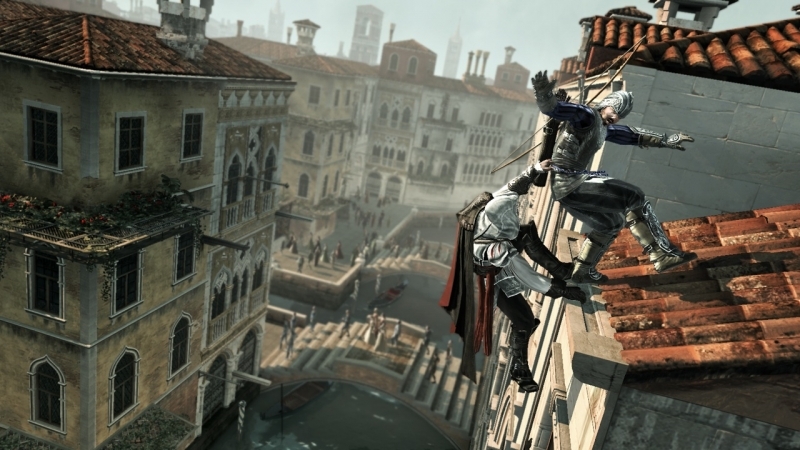 Battle of Forli is the first downloadable expansion to Assassin’s Creed II. 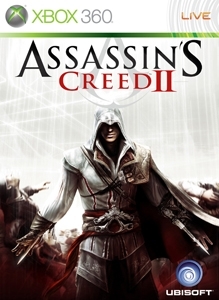 It is set during Animus Memory Sequence 12 of the life of Ezio Auditore da Firenze, taking place after he has located and acquired the Apple of Eden, and a little before he continues to the Vatican to complete his final mission. Naturally, you once again play as Ezio, this time instructed by the Order of Assassins to travel to Forlì, Romagna. This is the walled citadel of Lady Caterina Sforza, who is an important and powerful ally of the Assassins. Though smaller than Venezia (Venice) and Firenze (Florence), Forlì has many interesting sights. As with all such landmarks in Assassin’s Creed II, these are rendered beautifully, and described by the ever-cynical and typically British Shaun Hastings. 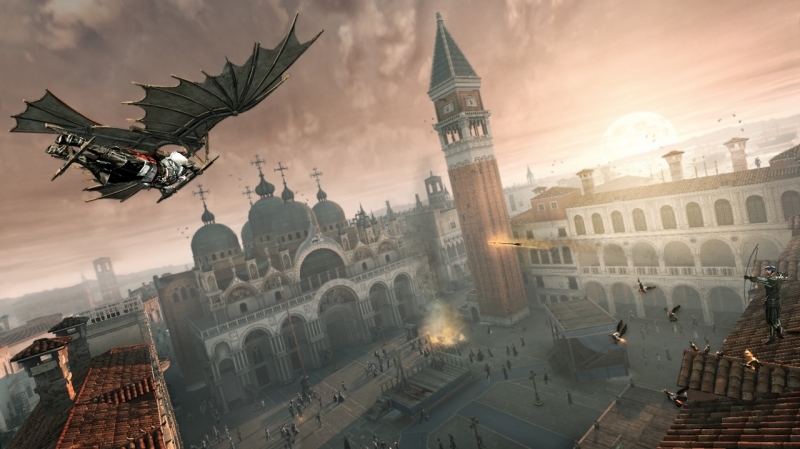 Though Forli existed in Assassin’s Creed II, it was never a place of much excitement, and Ezio never travelled there on the course of his main mission. Battle of Forli gives the player a reason to journey to Forli with a ten-memory long Sequence, in which Ezio defends the city of Forli, and attempts to retrieve the Apple of Eden from the vile Orsi brothers who stole it from the Sforza Palace. You are by no means limited to the main mission, of course. At the end of most of the memories you are free to take a break and wander around the idyllic countryside of Romagna or the distinguished stone buildings of Forlì, as beautifully designed as any in Assassin’s Creed II. The basic gameplay is of course the same, with the Puppeteer control system employed by the Animus. Triangle/Y controls the head, Square/X the right arm (Ezio is right-handed), Circle/B the left arm and X/A the feet. For more information on this control scheme, refer to our review of the main game. 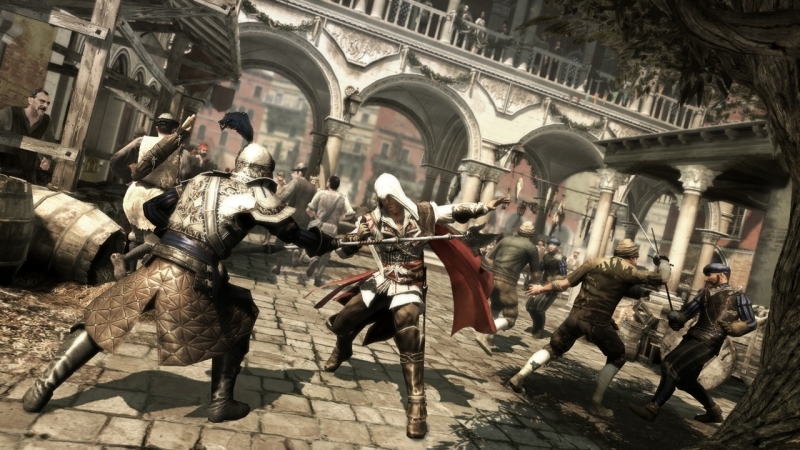 Battle of Forli has a greater focus on combat than Assassin’s Creed II, particularly combat involving large crowds of enemies. While the main game had many instances of combat involving a handful of soldiers, the Orsi troops are vast in number, and you’ll often be fighting ten or fifteen of them at once. This isn’t particularly difficult, of course; not for a skilled assassin with powerful weapons, hard-wearing armour, a plentiful supply of potions and poisons, and a handful of gadgets designed by one of the greatest minds of all time: Leonardo da Vinci. Instead, most of the challenge of Battle of Forli is related to the protection of your two helpless companions. Ezio is, essentially, a bodyguard, tasked with the protection of Caterina Sforza and the philosopher Niccolò Machiavelli who accompanies her. Being a member of the Assassin Order, Machiavelli is quite a skilled fighter, and Ezio doesn’t have to worry about him much. Caterina, on the other hand, is weak, loses health easily and yet is the first to run into battle with the heavily armoured guys with the giant axes. But then, that’s typical of her personality: as revealed by Shaun Hastings, the real Caterina defended Forli against the Borgia family themselves. But I digress - the point is that she’s a pain to keep alive, though she does make some hilariously violent comments towards heavily armed soldiers. The majority of the game is spent defending Sforza and Machiavelli from large crowds of said enemies. While this is enjoyable to begin with, it quickly begins to become monotonous. A good thing, then, that it’s so short. You’ll be done with this first section of the expansion in 30-40 minutes. There is a bit of search and rescue and, of course, some assassination, but most of Battle of Forli is spent protecting a loud helpless woman from heavily armed professional warriors, which really keeps it from having the same greatness, the same fun factor, as the main game. In fact, the main complaint with the original Assassin’s Creed was the lack of variety, and while beating the hell out of evil mercenaries is more enjoyable than doing chores around the city, Battle of Forli still lacks the variety that earned Assassin’s Creed II so much acclaim. However, there is one new addition in this downloadable content which is completely unrelated to the main storyline. This is another opportunity to use your flying machine. While you don’t really accomplish anything by using it, there’s something satisfying about flying over peaceful countryside and kicking soldiers off the tops of towers. If there was some other point to the flying section, I didn’t see it, but I’m still thankful for the addition. In case you want a break from slaughtering scores of soldiers but don’t want to figure out the controls of that flying machine, you can climb the viewpoints, find the glyphs and finish the assassination contracts of Forlì, but as these were all present in the main game, I shouldn’t really mention them in too much detail here. As I mentioned before, Forli and Romagna in the expansion are just as beautiful as the rest of the locations in the main game. And, as in Assassin’s Creed II, while the environments are intricately designed, the character models are somewhat subpar. However, you only really see character close-ups in cutscenes; from a distance, the people of Romagna look just fine. Lady Sforza’s voice acting is hilarious to begin with, as she hurls insults and threats at the soldiers on the walls above her, but she’s unusually quiet for the rest of the game, while Machiavelli doesn’t really say anything at all. Otherwise, the voice acting, music and sound effects are just like Assassin’s Creed II: for the most part, very good. The story is also interesting and well told, and seamlessly fits into that of the main game (except, of course, for the gap immediately after the end of Battle of Forli, which will be filled by the second expansion, Bonfire of the Vanities, if it is purchased). To conclude, I would wholeheartedly recommend Battle of Forli to anyone who greatly enjoyed the first game, in particular the combat, and those who would like a reason to visit what is, indeed, a very pretty little town while filling in the gaps in the Assassin’s Creed II story. 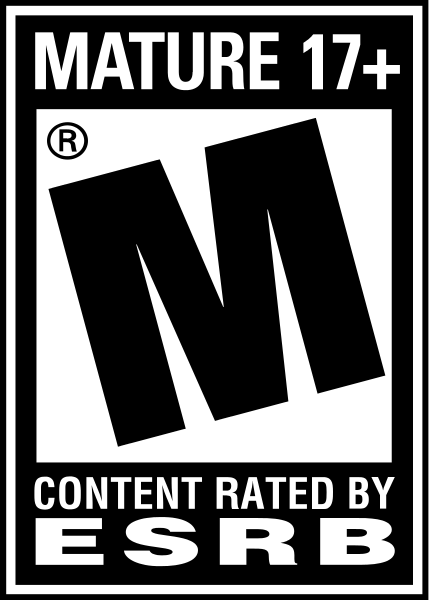 However, if you found yourself cringing at the combat of the main game, or otherwise not enjoying it, steer clear. Battle of Forli is aimed at a very specific audience; those who loved Assassin’s Creed II. 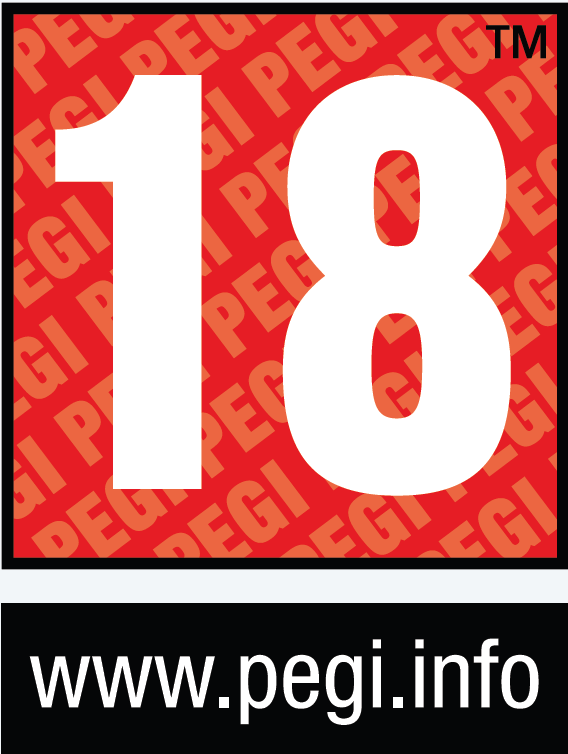 If you are a part of this audience, then for 320 Microsoft Points ($4.00/€3.72/£2.72) on X360, or $3.99/€3.99/£3.19 on PS3, you can get an enjoyable, albeit short, experience, which will fill in some of the gaping plot holes in a fantastic game.